Suicides are on the rise, school shootings seem a regular event, insanity and violence not unexpected. Are we seeing the collapse of Western civilization? I often wonder. 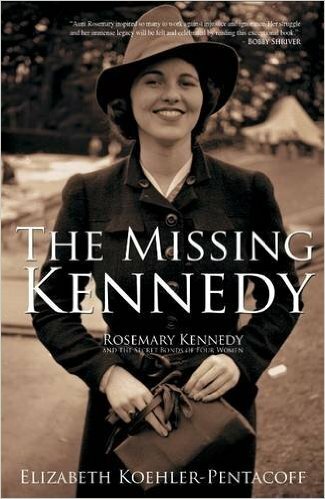 Then along comes a book like The Missing Kennedy, Rosemary Kennedy, by Elizabeth Koehler-Pentacoff (Bancroft Press, 2015). This is an important and encouraging book. The author tells the story of Rosemary Kennedy (1918-2005) from a personal perspective. Elizabeth Koehler-Pentacoff’s aunt, a nun, cared for Rosemary at St. Coletta’s in Wisconsin, a Roman Catholic home for the mentally ill. The young Elizabeth visited Rosemary when she visited her aunt, Sister Paulus. In this remarkable account, the grace of God ripples through the pages. Rosemary Kennedy, “Rosie,” was born a slow learner, and it is thought brain damage occurred during her birth, but she had no physical handicaps. The highest reading level she achieved was 3rd-4th grade. As she matured physically into a beautiful young woman, she became vulnerable and at times disruptive in her innocence, and her brothers did their best to protect her. Her father, Joseph Kennedy, learning of a method that might calm her and ease her life, allowed a lobotomy to be performed, a procedure that had been occasionally successful (at the time). But the operation made things far worse, partially paralyzing Rosie age twenty-three, and nearly destroying her ability to speak. She would need assistance in the basic functions of living for the rest of her life. This was truly a tragedy for all concerned. Joseph Kennedy sent Rosie to St. Coletta’s. For twenty years she was isolated from her family, the doctor decreeing such visits would disturb her. Finally, in 1961, sister Eunice and mother Rose began regular visits. So did the author, Elizabeth Koehler-Pentacoff. The author, a Roman Catholic, was clearly influenced by Rosie and Sister Paulus, and I could see the grace of God working through them all. Elizabeth’s dedicated aunt, full of love for the helpless, the abandoned, and the unwanted, touched the hearts of all in her circle through her example. I could see that the author was given a deeper sense of appreciation for the handicapped and what it means to love sacrificially as her aunt loved. The dignity of every living person shines through these pages. As I read this book, Governor Brown signed the bill legalizing assisted dying in California; the U.K. was studying the option, avoiding the word euthanasia, preferring death with dignity. Earlier and ongoing, the investigation of Planned Parenthood’s selling of baby body parts littered the news, the horrendous videos a reminder of what our nation has become. And of course, for the last forty-two years the unborn who might be handicapped or unwanted have been “terminated” in the womb under the euphemism of choice. What do these word-shifts do to our language? What do these actions do to our hearts? Do we become desensitized, hardened, with these images, these verbal aberrations, and these stories? And does a book like The Missing Kennedy do the opposite? Does the story of Sister Paulus and Rosie, of the Kennedy family, the author Elizabeth Koehler-Pentacoff, make us more sensitive, opening our hearts to loving as we are meant to love, without regard to handicap, without regard to degrees of perfection. When the Kennedys finally reunited with Rosie, they were inspired to help the mentally ill, funding research programs, passing legislation, and founding Summer Camp Shriver which became the Special Olympics. All of these efforts were the result of Rosie and her tragedy. Rosie’s handicaps became blessings, making those around her better. She taught them how to love. She taught our culture how to care. There seem to be two streams running through America, one of selfishness and one of selflessness. The great irony, the devil’s victory, is that the former leads to unhappiness, depression, and suicide. The self-centered life chases a greedy illusion of met needs and devours itself in its turning inward. The self-giving life, one seeking God’s path of sacrificial love, ends up discovering joy, meaning, and the actual fulfillment of the self. We are tempted today to throw out the undesirable, the inconvenient, the unborn, the less than perfect, the aged. And if we give in to this temptation, which might at times seem deceptively attractive and even arguable, we shall be changed as a people. We shall become hardened and we shall shatter. The Missing Kennedy is full of photos, many from the author’s private collection. The ones I particularly loved were the group photos. At first there is just Rosie and Sister Paulus, then others join, including the author, then more and more Kennedys gather around Rosie. She becomes, in the end, the center of the family. We are all better for her having lived, reminding us that the Rosies of our world have a place in the heart of our culture. We are better, too, for Ms. Koehler-Pentacoff’s heartwarming memoir of Rosemary Kennedy’s life. This entry was posted in Uncategorized and tagged Camp Shriver, culture, Elizabeth Koehler-Pentacoff, Eunice, grace of God, Kennedys, lobotomy, love, memoir, mentally ill, Rosemary Kennedy, self, selfishness, selflessness, Shrivers, Special Olympics, St. Coletta. Bookmark the permalink.